I don’t want to be slowed by rendering. So here’s the ONLINE 4K workflow I use on a laptop, yup … I said laptop. This is what I’m doing to have a RED 4K portable online workflow. For starters, I’m using a 2016 MacBook Pro. The 2017 MacBook Pro would work equally as well. 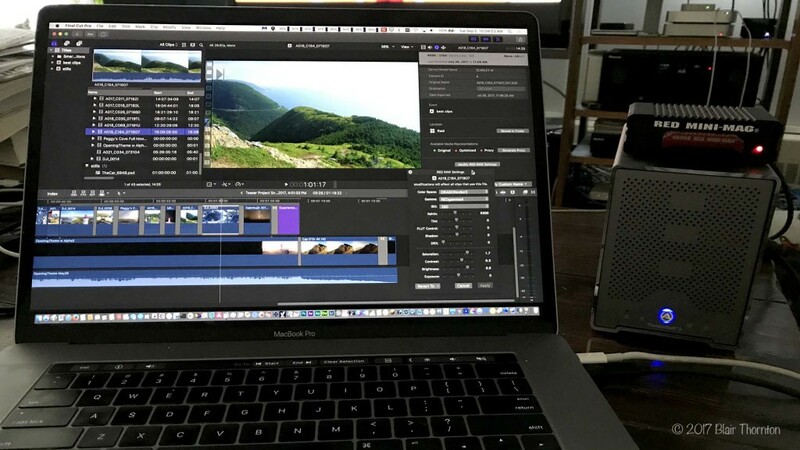 The secret to this solution is the Thunderbolt3 of the MacBook Pro and it’s processing speed, and the Radeon Pro 460 4096 MB option is also …. necessary. I’m using an AKiTiO Thunder3 Quad Mini case with 4 Seagate BARRACUDA ST4000LM024 2.5″ 4Tb drives. Empty, this Raid gives me 520Mb/sec performance. Full, it’s still 330Mb/sec. For editing, I’m using Final Cut Pro and I import my RED footage without creating ProRes originals, or ProRes proxies. The advantage of this is I can make colour correction changes, and immediately see the result in Final Cut, without the need to re-render the clip. For every colour change, I’m saving myself 6+ minutes of rendering. Older MacBooks don’t have sufficient processing power to stay in 4K with RED r3d media, and need to create proxies. 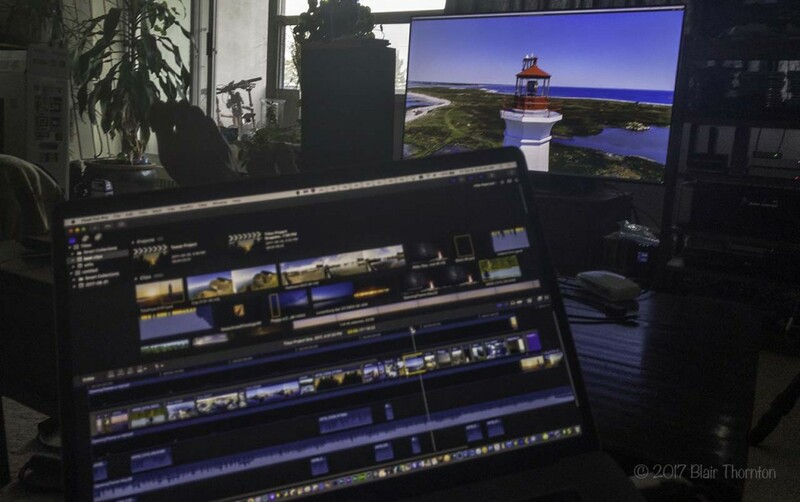 The faster MacBook allows for a full 4K online workflow. Picked up a SONY XBR55X900E 4K TV. 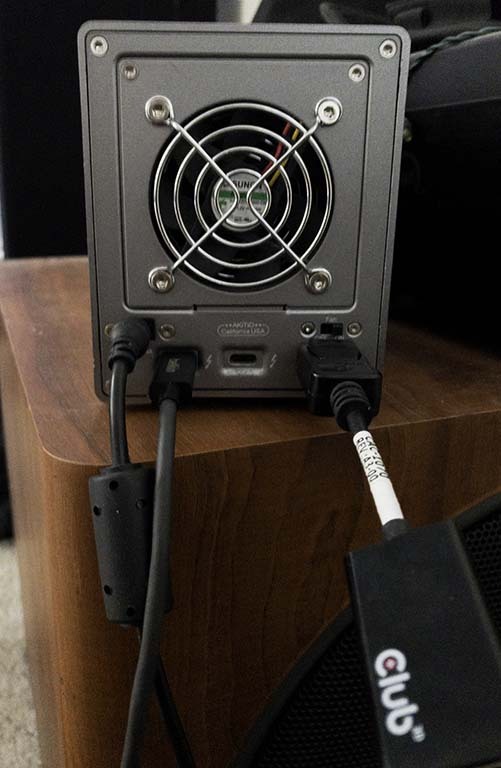 The AKiTiO Thunder3 Quad Mini case I have has Display port output, so I’m using an active display port to HDMI adapter and feeding the TV 4K 4:4:4 colour via High-Speed HDMI cables. This is all possible because of Thunderbolt 3 on this laptop. In the past SDI was needed to deliver 1080p 4:4:4 colour space to expensive colour accurate monitors for colour correction. Now I can do it in 4K via HDMI and a laptop. Super impressive. Calibration on TV and Mac was done using an X-Rite i1Display PRO.